It's a Sit-Down-Stay-Inside-Saturday here. We are supposed to hit around 105 today, so Mister and I have already finished our yard work and grocery shopping 'cause we aren't heading outside again. Fortunately, we have air conditioning; a lot of the peeps in the Bay Area don't and they are going to be suffering the next two days. I made my card quickly for this week's fun CAS-ual Fridays (CFC57) challenge, "Clear As Day." We are to create a project using acetate or vellum. 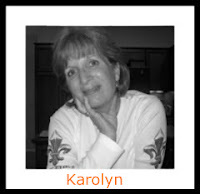 The outstanding Karolyn Loncon is the sponsor! My card has a base of white card stock, covered by a single sheet of pansy-painted vellum, adorned with a butterfly, and tied off with a ribbon. Very clean and very simple and very easy. I love the painted vellum papers, but they are hard to find anymore. I have no idea who made this particular vellum and, sadly, it was my very last little piece of it. When I was taking the pictures of my card, I noticed something really cool on my real pansies in the background. Check this out. Do you see the "drop" of purple on the top picture and no such drop on the bottom picture? It makes me giggle to think that even Mother Nature gets "splotches" on her art work! I have to apologize today to my new follower Queenie Jeannie of Jeannie's Happy World. (Don't you just love that name ~ actually both names?!). I like to greet my followers and tell my other readers all about them and somehow I skipped over Queenie Jeannie. Party foul! Welcome, Queenie Jeannie! Enjoy! I hope you stay cool, wherever you are! As always, thank you for stopping by to visit. Special thanks to you if you take the time to join as a follower or leave a comment! Well good for you Darnell! I have such issues with hoarding paper and supplies, it's good to see you put your last piece of paper to good use! Such beautiful creations Darnell! I love your card and as someone else said... Good on you for using the last piece of vellum. I'm a bit of a hoarder and may not have been able to do that!! The pansies are gorgeous. I hope you are all surviving the heat. I love your flowered vellum Darnell. You`re right it does seem to have gone out of fashion. I`m a bit envious of your heatwave. I don`t think I could cope with 105 but you could spare us 20 degrees and not miss it. It`s more like march here today, chilly, cloudy and damp, yuk. Oh wooow - stunning card!! I've never even heard of painted velum and now that I fell in love with it seeing your card I learn it's no longer made :((. Oh well, this makes your card even more special! Gorgeous pansies - both the real ones and the ones on your card! Stay cool! It's a lovely card ~ good for you for not hoarding! I am sure I still have some of this type vellum hoarded away! WOW! That vellum is gorgeous! So sad it was your last piece - but isn't it better on a card than in a drawer? Since you don't have any more of that gorgeous printed vellum, you'll just have to keep the card! How do you keep your pansies alive in that heat? Our's are pretty much cooked in NC. We are enjoying low humidity and lower temps for a few days. Love it! Yep ,even mother nature makes blotches . :) beautiful card and butterfly. The butterfly goes perfectly with that paper, nice match. Painted vellum is a lovely idea for the challenge Darnell! What a beautiful card! Such pretty painted vellum papers too! I just have to mention that you take such lovely photos. Darnell, those painted flowers are stunning. I really love the layered butterfly as well. Beautiful colors! Thanks so very much for joining us at CAS-ual Fridays this week! Perfect way to use that last bit of vellum, because this is absolutely gorgeous! That butterfly is perfect with it too. Bonnie, we've got to find that great painted vellum again! Your card is simply marvelous. I'm thinking... if we put your photo of pansies under a sheet of vellum and just paint with markers! Thanks again for inspiration. Love your flower card, Darnell! I almost thought it's store-bought~~~ It's so beautiful! So glad that you join the fun with us at CAS-ual Fridays! Oh my goodness Darnell, the is absolutely stunning. I love the pansies from your garden and your card. Gorgeous card, love that paper! Thanks for playing this week at CAS-ual Fridays! Whoa! This is so pretty, Darnell!! The colors are the exact match of your pansies. So, so elegant! Thanks so much for playing with us at CAS-ual Fridays! We're so glad you did!